2019 - Celebrating 40 Years of Quality and Service! Since 1979 SALSCO, INC. has built its record on quality and service. SALSCO manufactures Gas & Electric Greens Rollers, Leaf Vacuums, Slicer Seeders, Wood/Brush Chippers, (PTO and Engine Driven up to 18” capacity & 205HP) Shaving Mills, Curbing Machines, narrow-width Asphalt Pavers, Bale Wrappers and Grabbers. SALSCO has built its reputation over the last 35 plus years, by listening to our customers. The entire SALSCO team takes pride in producing equipment that allows our customers to meet their goals more efficiently and with less down time. SALSCO Gas and Electric Greens Rollers can be found at top rated Golf Courses and Country Clubs throughout the world. The SALSCO Greens Rollers come with an unprecedented 5-Year Warranty. SALSCO has just brought to market the Tracked Mini Paver. Early orders from dealers indicate that this product should have an exciting first year in the market. We’ve started shipping, and the response from the field has been excellent. 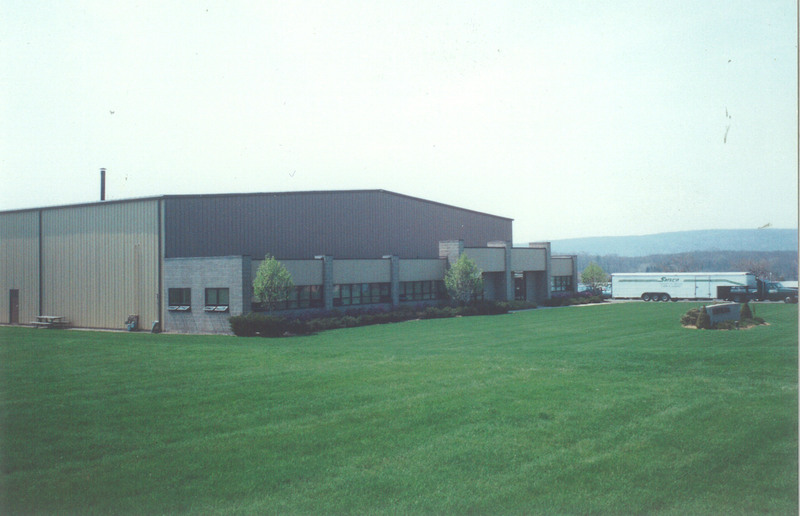 All SALSCO products are designed and manufactured in Cheshire, CT at our newly expanded manufacturing facility. All phases of the manufacturing process are handled "in house" including, providing a baked polyester powder coat finish. 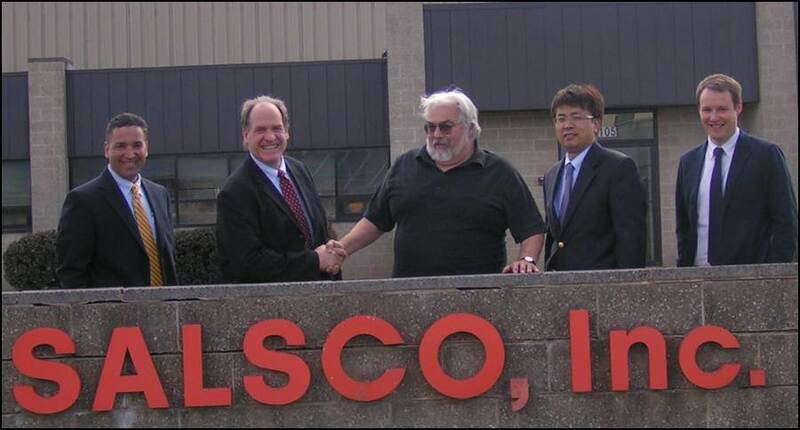 As SALSCO celebrates over 40 years in business, they employ over 60 people, and market over 40 products. In-house salespeople and over 200 dealers and sales reps distribute SALSCO products worldwide. Plans for expansion and new products are always in the works as the company looks forward to its next 30 years and beyond. Many of you know, it's not easy getting a foothold in a market dominated by large manufacturing companies. 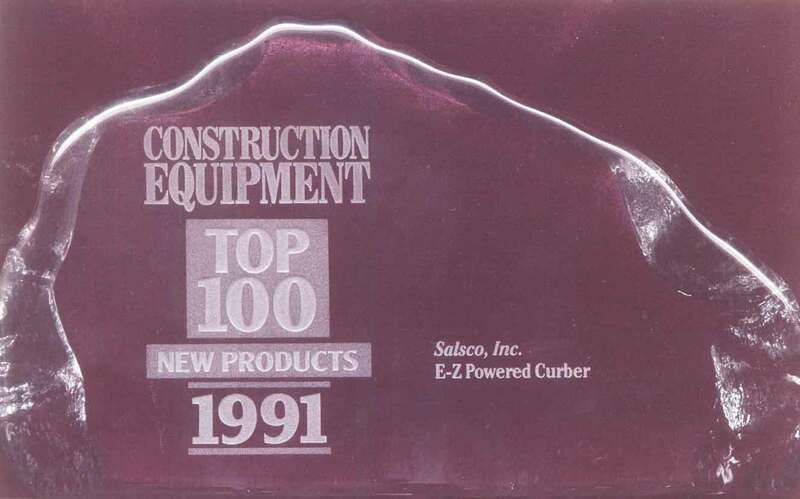 Sal has always known that despite such heavy competition, Salsco could manufacture products that were not only superior to anything available, but that they would also set new industry standards. 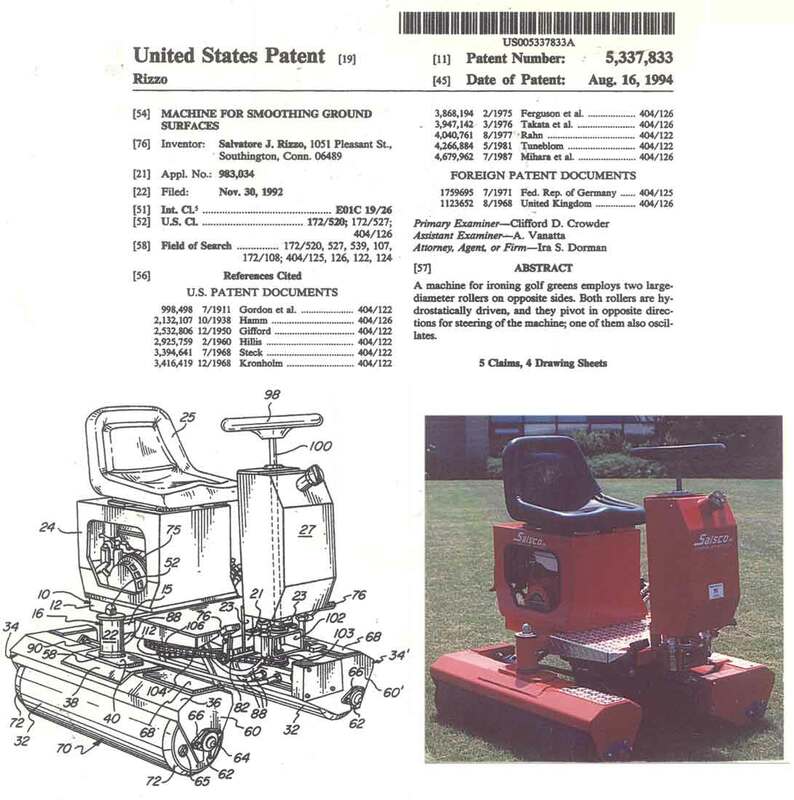 During the 1980's Salsco developed and manufactured the Salsco Lawn Maker, a 4-wheel drive unit which articulated and oscillated to make it maneuverable with excellent traction. It could put down grass seed and fertilizer (both wet & dry) at a rate of 60,000 square feet per hour. This unit could also spike and roll simultaneously. Salsco also made a less expensive version of this particular machine, the Aerator 30-6, a 2-wheel drive unit with a tag-along dolly for the operator to ride on. This walk-behind version was just for grass seed and dry fertilizer. 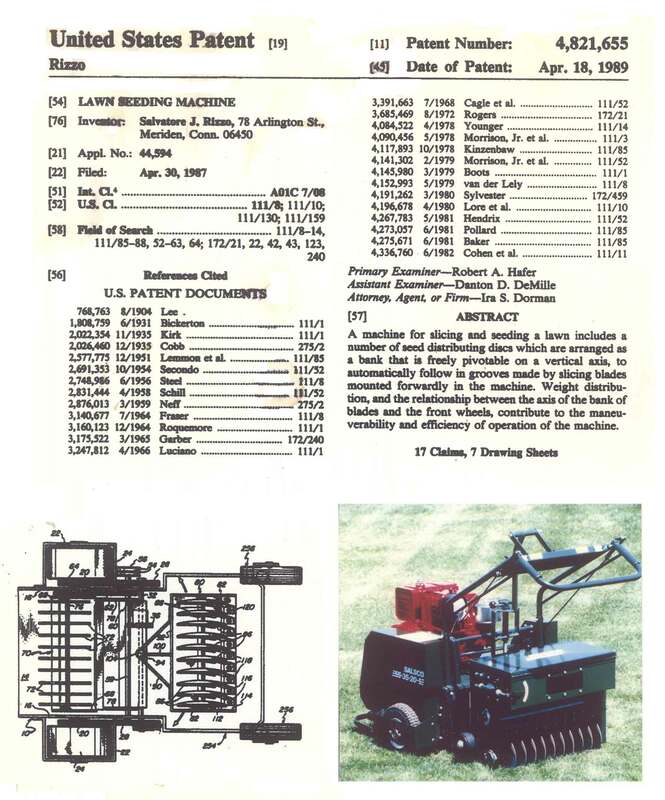 In 1983 Salsco manufactured the first Vertical Free-Floating Tine Core Aerator for the Lawn Care Industry. Soon the 30 Series Core Aerator line was being manufactured and sold to lawn maintenance professionals and golf course superintendents throughout the United States. 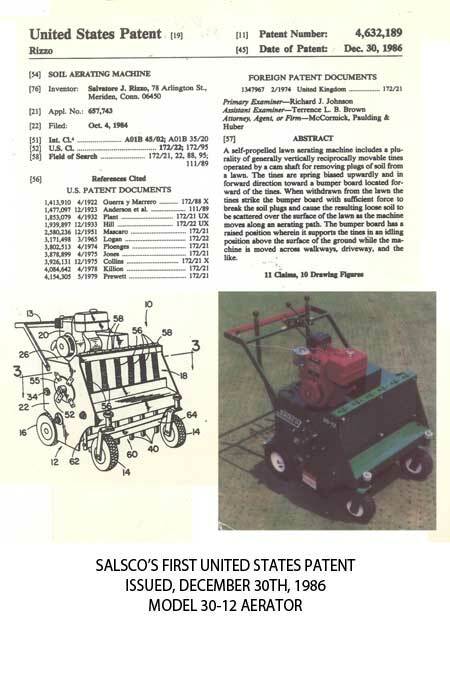 In 1986 Salsco raised the bar again with the FTA 60-24, All-Purpose Aerator, a tow behind machine that could core 60,000 square feet per hour. This machine cored greens, fairways and sports fields and could be towed easily by almost any vehicle. The driver of this unit could lower and raise the aerator housings while simultaneously controlling the throttle. One year later, Salsco began manufacturing other lawn and turf products like the Slicer Seeders - Model 352, 353, 354, and 355. 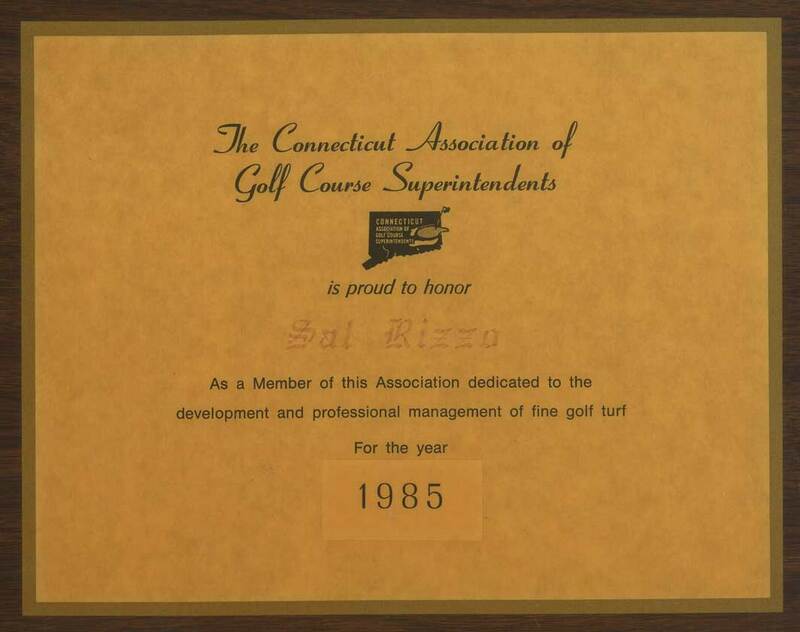 Salsco introduced about eleven new products to the Turf and Lawn Care industry during the 1980's and began to be known more as a "broad-line manufacturer" of these products. Some of the new products during that period included self-propelled Drop Spreaders, Truckloader Leaf Vacuums, Dethatchers and Seeder Dethatchers. The 450 Series Drop Spreader line comprised three models with hopper widths ranging from 26" to 50". Powered by 3HP Briggs & Stratton engines, these self-propelled spreaders were capable of covering 30,800 to 57,200 square feet per hour. Salsco still holds the patent on a machine that will seed in a tight 30" radius. These units would plant seeds in the groove created by the cutters giving seed to soil contact. The Model 380 Seeder Dethatcher was next in line and was a 4-wheel unit for the landscaper. It planted seed like the Model 355 Slicer Seeder but was a more basic unit for the rental and landscaping markets. Salsco then made a number of Drop Seeder/Dethatchers. These units acted as dethatchers and could also drop seed. The Truckloader Vacuum line was introduced during this period and was comprised of four models. The 716 and 720 were designed for larger clean up jobs and came with a number of options. The 708 and 709 were designed to mount easily on the tailgate of any truck, without tools or vehicle modifications. Somewhere in this mix was a paving contractor that approached Sal with a Rubber Tire Paver, both the concept and the proto-type unit. In 1986 Salsco entered the construction market with the introduction of its Sidewalker Asphalt Paver. This machine was ideal for paving golf cart paths and was a logical extension of the Salsco line. The Sidewalker Asphalt Paver was capable of paving well over a mile of 6' wide path a day, and could be easily adjusted to pave as narrow as 36" wide. Its 54" width and 6' turning radius made paving alongside trees on paths, walks and trails easy. Over the next 20 years Salsco would modify and advance the unit until they got to the Track-Pavers of today , Models TP44 & TP411. In 1989 Ransomes bought most of Salsco's products and the company began its color change from Salsco green to the Salsco orange of today. Despite the fact that Salsco sold the rights to manufacture its products, there was never a non-compete clause to prevent the company from continuing on. Salsco changed its color and continued to manufacture "top of the line products". 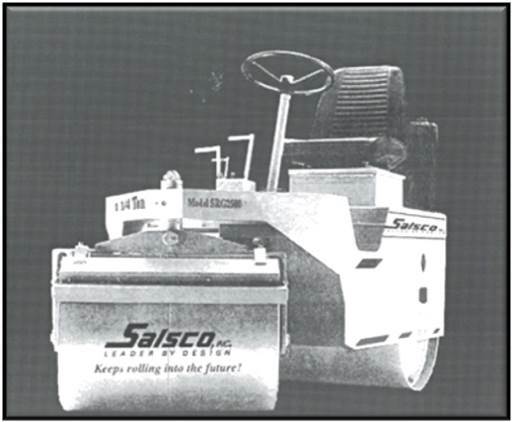 By the early 1990's Salsco was also manufacturing a series of Debris Blowers. 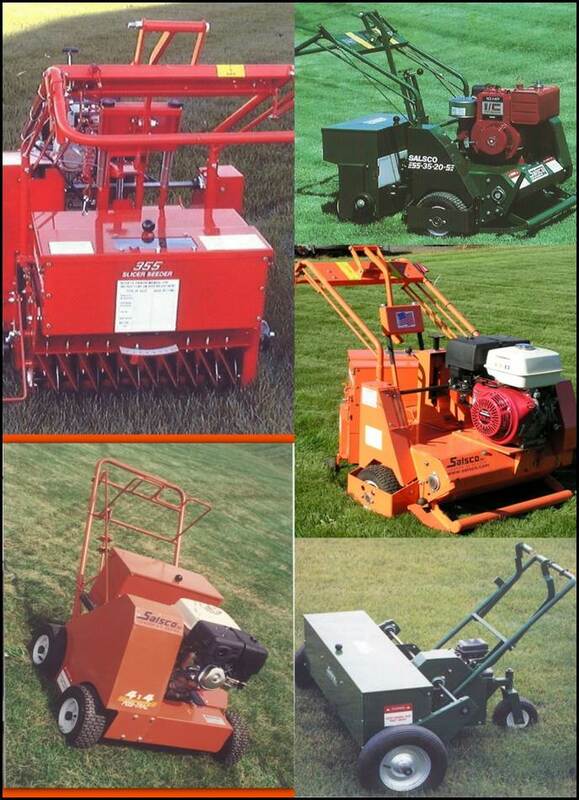 The 300 Series line of Walk-Behind BLowers, provided a wide selection of top quality machines. Each model contained a balanced impeller that gave the user both side and forward air streams. Specific models came equipped with a debris intake for cleaning up leftover debris. Every model was constructed with heavy-duty steel, and finely balanced for smooth operation. During this time Salsco manufactured a number of utility vehicles for municipalities, golf courses, parts, cemeteries, schools and colleges. Durability, versatility, price, and service were some of the factors driving this market and a large number of companies were competing for a small space. The Turf Ranger Utiity Dump Vehicle had a 1500 lb. capacity and 22.7 square foot cargo area that made it ideal for transporting materials and equipment. The Mighty Mark was a hydrostatic, all wheel drive utiiity vehicle powered with a 20HP Kohler engine. It was a rugged vehicle that featured a heavy duty boxed beam frame and double-walled tailgate ramp. The Citrus Cart was designed for one of the Minute Maid Orange Groves in Amoxil, FL. The high-flotation ties and all wheel drive allowed the vehicle to easily negotiate the water canals around the orange groves. The large flatbed was used to carry hoses, tools, and fittings needed to repair the groves irrigation systems. The small 7-1/2 HP Kawasaki Engine was fuel efficient and could idle all day wtihout overheating. The high light-bar allowed the unit to be seen on dirt roads through the dust from trucks hauling oranges through the groves. This was an especially busy time for Salsco, the company was still young and testing different markets every step of the way. Salsco had its own Nursery Division, responsible for manufacturing Nursery Flat & Plant Carts, Greenhouse Furnaces, A-Frame Display Shelves, and Nursery Cart Transport Trailers. One of the most popular items produced by this division was the Lazy-Susan. This machine wrapped products securely every single time and was never tired, fatigued or dizzy. 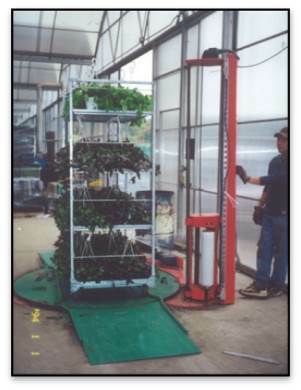 Before the Lazy-Susan, the worker would have to carry a large, heavy roll of plastic and walk around the cart to wrap it securely before loading the planter carts onto trucks for transport to local nurseries and garden supply centers. This particular job was done while in the green houses and was very exhausting and tiring. With just one push of the buttom, the worker could double wrap a cart in just minutes. One year while at the Golf Show in Law Vegas, Sal looked at all the different Greens Rollers on display. These units were imported into the United States and Canada and were specifically designed to roll outdoor bowling courts in New Zealand and Australia to flatten and compact them. They were imported into the states to roll golf course greens, a new technique for smoothing the greens. These units would also compact the greens which was not the result the Superintendent was wanting to achieve, as this led to unhealthy grass. On his way home, he sketched a Greens Roller on the plane on some napkins and eight days later Salsco had a prototype Greens Roller on the ground. The Salsco Greens Roller could be used on or off any type green or tee, and was and still is equipped with Dual Articulating Steering and Oscillating Rolls to follow even the most severe undulating greens without changing the undulations built into the green. The operator could roll a green in a diminishing circle to 30" without marking the turf or straight back and forth, similar to mowing. 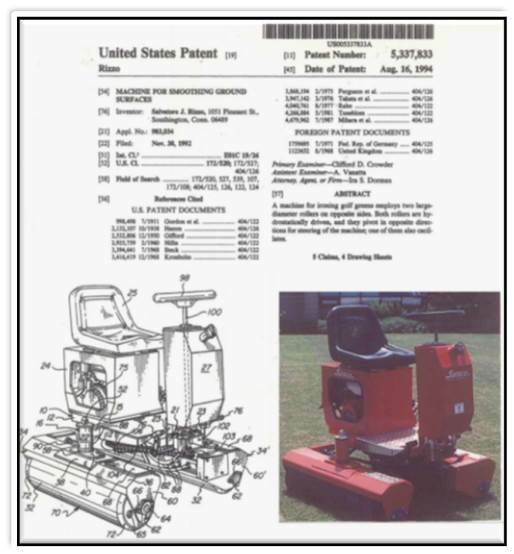 United States Patent for its first Greens Roller. 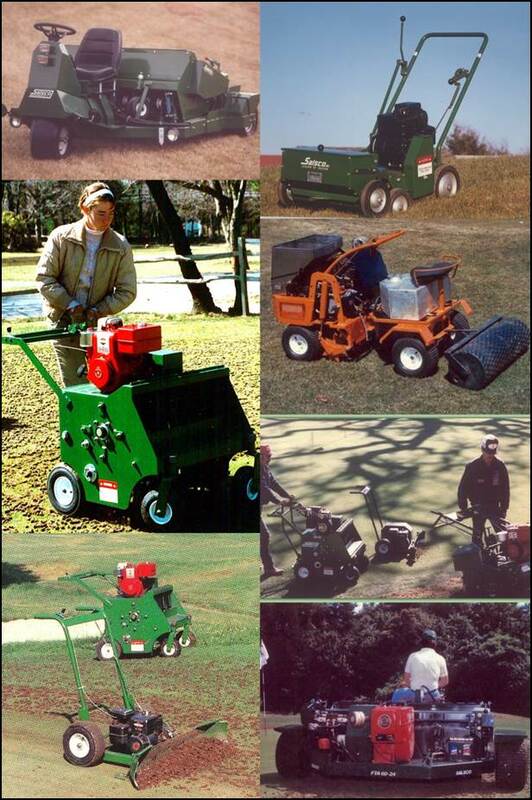 From this basic model the Salsco rollers have evolved to the Models HP-11, HP4, HP5.5, Electric Greens Roller, QC, and most recently, the Roll-N-Go and the Tranz-Former. The Salsco Roller is still considered by most Superintendents around the world to be the # 1 Roller for Greens, Fairways, Tees and even Sports Fields. 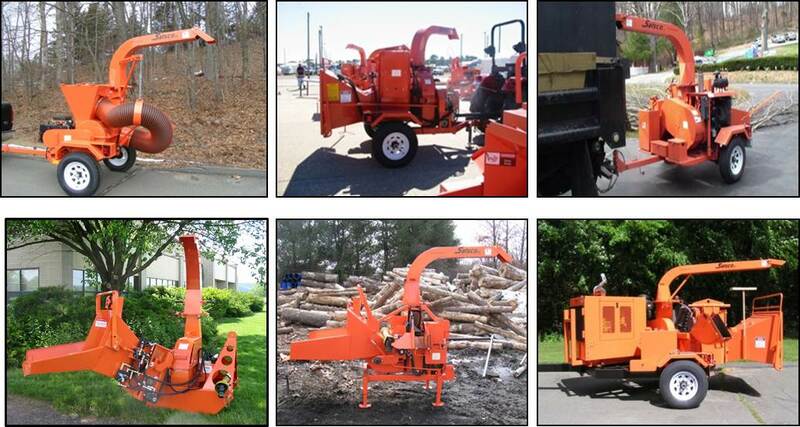 During this same period Salsco designed and introduced the Model 813 Wood Chipper. 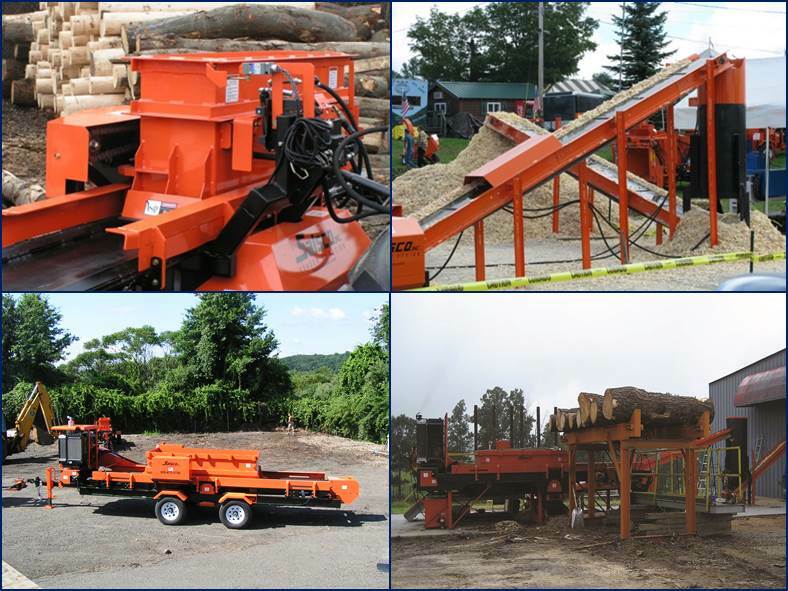 Over the years the line of chippers produced by Salsco has evolved into a complete line of Wood Chippers from a 3-1/2" capacity to an 18" capacity, both engine driven and PTO driven. All of this activity did not prevent Sal from noticing that there was a need for another type of wood product in the agricultural industry for bedding, and Salsco began to experiment with different feed and speed rates. Sal found an old man on a hill in Georgia who built his own machine to make wood shavings, and was supplying local farms with bedding for their horses. The trouble with his operation was that it took up two acres of land and the sorce of power to run the mill was from an old yellow school bus. Sal quickly redesigned, modified, and improved upon what he saw and came up with the Shaving Mills of today. 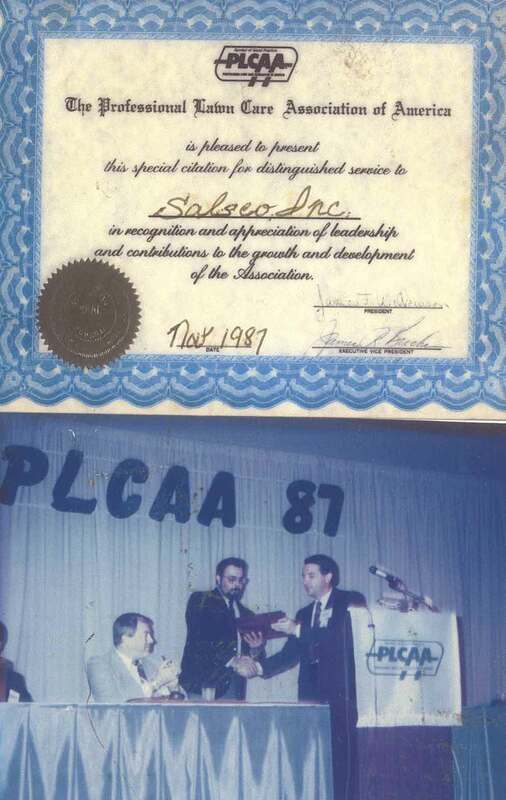 Salsco, Inc. was founded by Sal Rizzo in 1979 as the result of a good idea and a desire to work for himself. As a "family business" it has sometimes been a challenge to fund the growth and development of the company. However, the underlying spirit of energy, determination, vision and a willingness to take risks has brought the company to where it is today. As Salsco celebrates over 35 years in business, they employ over 60 people, and market over 40 products. In house salespeople and over 200 dealers and sales reps distribute Salsco products worldwide. Plans for expansion and new products are always in the works as the company looks forward to its next 35 years and beyond.